RISE was a bit different yesterday morning. On every attendee’s chair is a simultaneous translation headset—Wang Xiaochuan, the Chinese-speaking CEO of Sogou was here to speak on artificial intelligence to an international community of investors, entrepreneurs, and industry players. Some attendees start to take off their headsets as they notice the live translation subtitles on the big screen behind Wang. 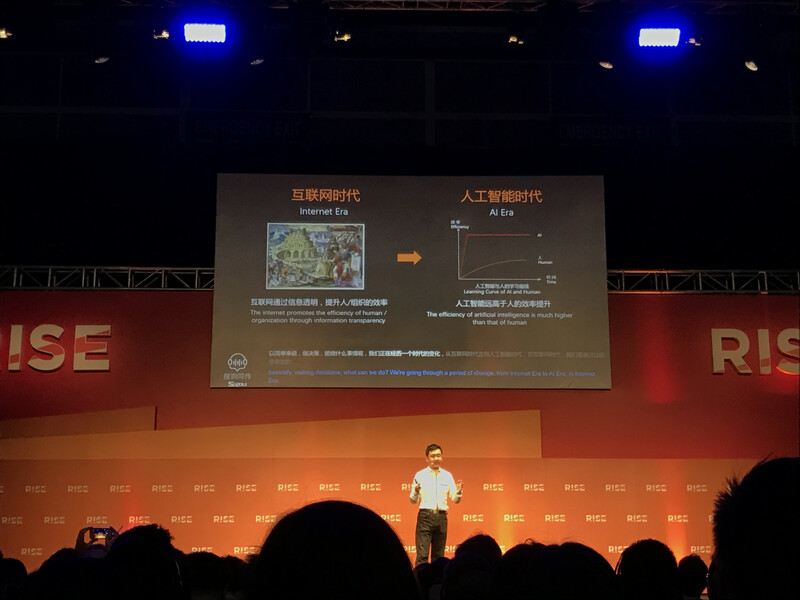 “My entire talk today is supported by Sogou’s simultaneous machine translation,” Wang reminds the audience, gesturing at the transcription of his Chinese speech, line by line, with near real-time English translation rolling across the screen as he speaks. The Chinese dictation is almost error-free, as long as Wang is articulating in complete sentences. The English translation, though clunky, is good enough to grasp the general idea of Wang’s speech. Over the last 20 years, the search experience has involved users inputting a keyword and getting 10 links for the results, and they probably still need to spend time selecting from those results. Another AI promise from Sogou is map navigation. “It’s dangerous when you are driving and swiping on your navigation app on the phone,” says Wang. But with voice recognition and AI-powered Sogou Search, you can “talk” to the app and learn not just how to get somewhere but a wide range of knowledge: when Sogou Navigation hears “let’s get some gas”, it tells the driver where the nearest gas station is; when it hears the driver mention a flight number and an airport name, it reports back the flight status and calculates the best route to avoid missing the flight. Wang announced at RISE that Sogou Navigation is launching next week.